In the very early days of the Bioscope, when its total readership could probably have been fitted into a broom cupboard with some comfort, we reviewed Cinema Context, one of the leading film-related resources anywhere. Four years on, the broom cupboard has expanded somewhat, and it’s time we returned the resource, and devoted more attention to it. So let’s do so. Cinema Context is a database of Dutch film culture. There’s something about the Netherlands that makes it just about the right size for a country when it comes to apportioning things (geographically, demographically, economically), and it’s the case when it comes to film databases. 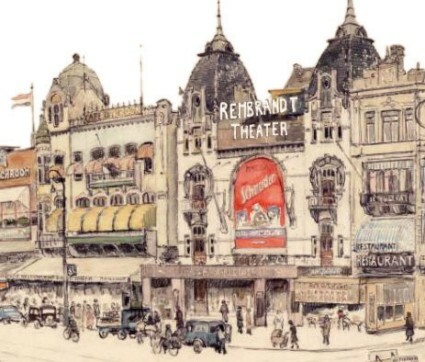 At the heart of Cinema Context is data on all of the Dutch cinemas, including travelling cinemas, that have existed since 1900 – there are 1,615 of them – and so far as I know the Netherlands it the only country to have comprehensively documented its every single film venue. The venues have then been mapped to almost every film shown in a Dutch cinema up to 1960 (45,582 of them), so that one knows not only what was shown, but when it was shown, and where. This information has been taken from a wide variety of film programme information, from which data has been added on musicians, live performers, entry prices and more. There is a whole range of people (4,259) and companies (1,611) listed, from cinema managers to distributors, so one does really get a sense of the depth and extent of Dutch film culture. It is, by the way, a bi-lingual site – Dutch and English. What Cinema Context does not provide is much in the way of filmographic detail, but it does link every identifiable film to its record on the Internet Movie Database, so it is possible for the dedicated researcher to trace not only which films but which performers very popular in which part of the country, and how such presence changed over time and territory. The site does not exist to give you every answer, but rather to provide a solid basis on which to go looking for answers. There’s a browsing option, which is probably the best way into the resource. Here you can look across cinemas by year or by city; films by country, year, title (original or Dutch); by company (exhibitors or distributors, but not production companies); by people (name or function); and by censorship rating, year or file number. This latter element is an exciting development. Every film record between 1928 and 1960 on Cinema Context has been cross-linked to the record of its file from the Netherlands Board of Film Censors, as held by the Nationaal Archief in the Hague. It does just point you to a catalogue entry rather than a digitised document or transcript, but let’s not be greedy. Cinema Context remains a work in progress, and is keen to grow further. Such additional features will be added in time. And there’s more. The site offers some useful statistics, such as cinema attendances and film production year by year in the Netherlands and selected cities, a listing of all Dutch film magazines, and a map of the country which links you to cinemas on the database. What is the finest film reference source on the Web, for all film let alone silent film? With all due respect to the Internet Movie Database, I think it is Cinema Context, a Dutch site created by Karel Dibbets and the University of Amsterdam. I think I still stand by that, though it may now share first place with Germany’s Filmportal, while resources produced since 2007, notably the University of North Carolina’s more localised and more specialised Going to the Show, demonstrate how to take this sort of data to the next level through the new search tools that are now available. And I see no reason to change my original summing up of the resource: “This is the new film research. Every nation should have the same”. I don’t know the degree to which these databases of cinemas rather than films have succeeded in opening up cinema history to social and cultural historians in general, and not just a film studies audience, but that has to be the intention. Resources such as Cinema Context must exist to facilitate the fundamental question that should be asked of film history, which is how it related to society. My feeling is that such databases – other examples are the London Project, the Scottish Cinemas and Theatres Project, the Utrecht Project, and the huge American site Cinema Treasures – still direct themselves primarily towards an audience which understands film culture first and foremost. They may seek to answer new questions, but it is unclear if they are sufficiently reaching out to those who are asking those questions. It is when Cinema Context or the London Project map themselves to population figures, transportation data, domestic expenditure, or the competition from alternative attractions, that we may really start to compute the historical position of cinema in society.